I had to take a break from knitting after Trellis. A high concentration of knitting over a short period of time makes for a pooped Nik. After I complete a power knitting project, my hands don't even want to touch another piece of knitting for a couple of days. I don't force them to, either. I just wait until I get that itch again. I got the itch last night and was up until 1am working on a hat/scarf graduation gift set for a friend who received her Ph.D. on Wednesday from N.C. State. I've started on the scarf but I'm going to rip it out because I don't think it's wide enough. I still have Xmas knitting to do. Yep. This is a shortened version of Bling (pattern to the right). Faithful readers might remember that I made these for my cousin and her daughter one Xmas. I put some small Bath and Body Works lotions inside of them, and they loved them. I'm making a blue version for a friend who's been asking for it since last year. 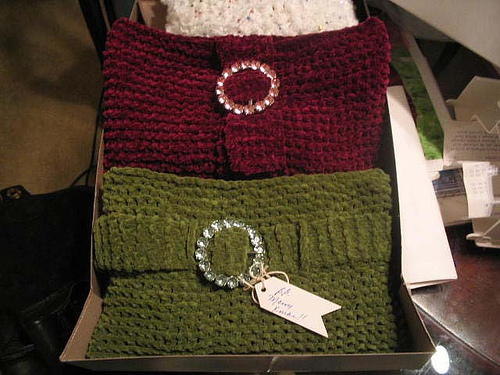 -A set of "warshcloths" for another friend, along with some fancy soap. 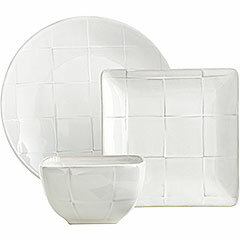 I found a square salad plate (below) at Pier 1 that I'm going to "ribbon tie" the cloths and soap to. Oh, and in MY world, that salad plate shall be known as a soap dish. -My Mama's Republic Hat in black. I have to find a fabulous button for it though. -My cousin Kenshun's TWO hats. At his request. One of them will be losely based on The Republic-infused with more testosterone. That is, it will not be adorned with a girly button. People will be receiving my handmade Xmas gifts as late as the beginning of February. I can't be held to no stinking deadline. I often receive e-mails from people. If I don't get back to you, it's not because I'm ignoring you. You know I love you. I'm probably somewhere far, far away from a computer and can't answer you quickly. Things should be back to normal after Xmas. I may post occasionally if time permits.